Remnants of Cape Flats Sand Fynbos, critical for biodiversity and the health of the Cape Foristic Biome will be paved over. The Hawks were investigating a complaint of fraud laid against the developers by a private citizen. However, there was court case open. And the only negotiation called into question by the investigation was the negotiation between the City and the developers. But while the City claimed that this investigation precluded any discussion with the Princess Vlei Forum, Deputy mayor Ian Nielson said in press interviews that negotiations with the developer were ongoing. We were concerned that the City was cynically using the Hawks investigation to deny us the opportunity of putting forward the case for Princess Vlei. 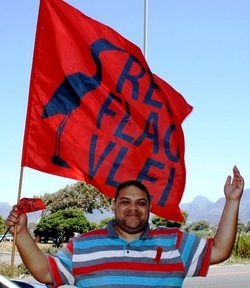 So the Red Flag campaign was also a red card campaign to warn the City that they were not playing the game by their own rules of fairness and democracy; that their willingness to sell out to developers at Princess Vlei made a mockery of their claims of compassion, transparency and accountability. Although the City had now withdrawn its support for the shopping mall proposal, we will continue to award the vlei "red flag" status until we are confident that it is adequately protected from destructive development now and in perpetuity.